We are very excited to announce an upcoming project we’ve been working on with Denver based painter William Matthews. Best known for his depictions of the American West, Matthews is a skilled watercolor artist whose work appears in many private and public collections including the Museum of the American West in Los Angeles, the National Cowboy Hall of Fame in Oklahoma City and the Denver Art Museum, just to name a few. Creative Project Manager, John Grant on site with the fabricators in Cuernavaca. 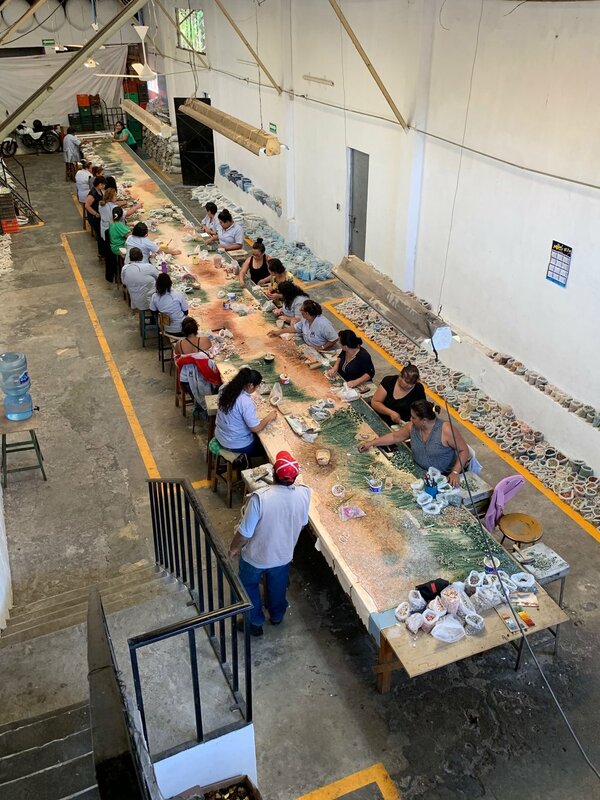 Public Art Services, Creative Project Manager John Grant and Matthews just returned from a trip to Cuernavaca to check in on the progress of a massive mosaic tile mural reproduction of Matthews original watercolor painting. The talented artisans behind the creation of this mosaic tile mural. Each tile is individually selected and cut by hand using special hammers. A life size reproduction of the work is used as a template to guide the skilled artisans during the creation of the mural. A detail of the mosaic tile mural. Once completed this 63' x 12’ mosaic tile mural will be installed over the South entrance of the new 14,000 seat, 230,000 square foot Dickies Arena, adjacent to the Will Rodgers Memorial Campus in Fort Worth, Texas. When installed, bronze bas-relief sculptures, translated from Matthews original watercolors, will flank both sides of the mosaic tile mural. William Matthews with the talented team of artisans working on his mosaic tile mural. This project is a great example of translating an artists preferred medium into a durable material that is both visually stunning and will stand the test of time as part of an outdoor installation. Check back for more updates to come on this project and visit our completed projects section to see how we worked with Matthews in 2016 to translate his work into a beautiful woven tapestry for the Country Club Towers in Denver. William Matthews with a 12’ clay rendering for the bronze bas-relief sculpture. If are you in the Denver area, join us Thursday March 7th from 4pm-7pm at William Matthews Studio for a sneak peek at the 12’ clay renderings for the bronze bas-relief sculptures. 2018 was a big year for Public Art Services, we wrapped up seven large scale public art installations spread across two countries and seven cities and we began work on several exciting projects to come in 2019. Here’s a look back at 2018 and the artists we were fortunate enough to partner with to help bring their creative visions to life. In May of 2018 Donald Lipski’s SPOT, an already iconic 2 1/2 story tall Dalmatian balancing a real Prius taxi cab on its nose, was unveiled at NYU Langone's new Hassenfeld Children's Hospital in New York. Lipski wanted to make something so astounding it would distract even those arriving for the most serious procedures, and so lovable that young patients coming back again and again with chronic conditions would see SPOT as an old friend. "I like to think that the parents, the doctors, the nurses, the staff and the neighbors, will all be smitten by this playful, heroic young dog doing the impossible. Art has actual healing power," says Lipski when describing the 2 1/2 story tall Dalmatian balancing a taxi cab on it's nose. The Hassenfeld family, which started the Hasbro toy company, were major donors for the newly constructed hospital which influenced Lipski's thinking, "I wanted it to be about toys and play in some way." In May 2018 Catherine Widgery's Woven Light was inducted into Denver’s Public Art Collection. Located in Northfield's Uplands Park in Stapleton, CO, Woven Light is an outdoor room; you are inside and outside at the same time and the shadows, light and projected color make you more conscious of the sun and the breeze than if you were standing in the open. When seen from the outside, the dichroic glass between the slats reflects the sky and surrounding trees. Inside is like being in a kaleidoscope of moving colored lights on the darkened interior as the sun shifts angles. We can look through the openings or through the glass that changes the color of the landscape like a lens. Endlessly changing patterns of crisscrossing shadows and reflected light within and on the ground dematerialize the structure and make a rich shadow on the ground extending the impact of the art beyond its physical boundaries. In August of 2018 Donald Lipski unveiled his design for the pedestrian overlook on the new Lesner Bridge in Virginia Beach. It is a freestanding sculpture consisting of a stainless steel catenary arch supporting 10 canoes arranged in a star pattern, with a delicate filigree of cut out patterns. Lipski came up with the canoe design after learning that Adam Keeling, who owned a plantation nearby in the 1600s, and a group of others, dug a trench wide enough for a canoe to cross a sandbar between the Lynnhaven River and the Chesapeake Bay. A storm with high tides widened the ditch that became the Lynnhaven Inlet. In September 2018 Larry Kirkland’s Grant Street Pier in Vancouver, WA was opened to the public. Kirkland’s design features a mast intended to mirror a sailboat passing along the Columbia River. The Pedestrian Wharf is suspended over the Columbia as a cable stay structure. Installation is currently underway for Kirkland’s design for the Columbia Basin Water Feature constructed from massive engraved marble blocks and cast bronze detailing. Stay tuned for more details to come in 2019. In November of 2018 we wrapped up not one but two Donald Lipski installations, once of which was The Nest for Calgary’s spectacular new 330,000 sq. ft. Seton Recreational Facility. Donald Lipski created a nine foot diameter acrylic “nest” with three flocks of life-sized hawks, owls and herons flying to it, each bringing a new branch for the nest. The nest was built in Denver, CO and the birds were brilliantly sculpted by Christopher Collins in Pennsylvania. We’ll be sharing more info later in the month in regards to the other Lipski installation we wrapped up this past November. In November 2018 Matthew Geller’s interactive sculpture As Rose As Rain was unveiled at the Colorado School for the Deaf and Blind in Colorado Springs. The circular bench seats up to a dozen people who can rock and sway on the bench that is supported by four large compression springs. The dynamics of compression springs and their uneven spacing means the structure responds differently depending on where one sits and how many people are sitting on the bench. The artwork’s sloped canopy includes nine translucent colored polycarbonate skylights that rock along with the bench. On sunny days, the canopy’s shadow and color projections on the ground move in sync with the bench. The canopy also creates a passive water feature as it collects rainwater (or snow) that drains through a hole and splashes on the ground into a circular gravel-filled drain. In December of 2018 our focused shifted to local, Denver based artists as mural painters began work on two large scale reproductions of works by Denver based painters Daisy Patton and Kevin Sloan for Continuum Partner’s new development at 9th and Colorado. 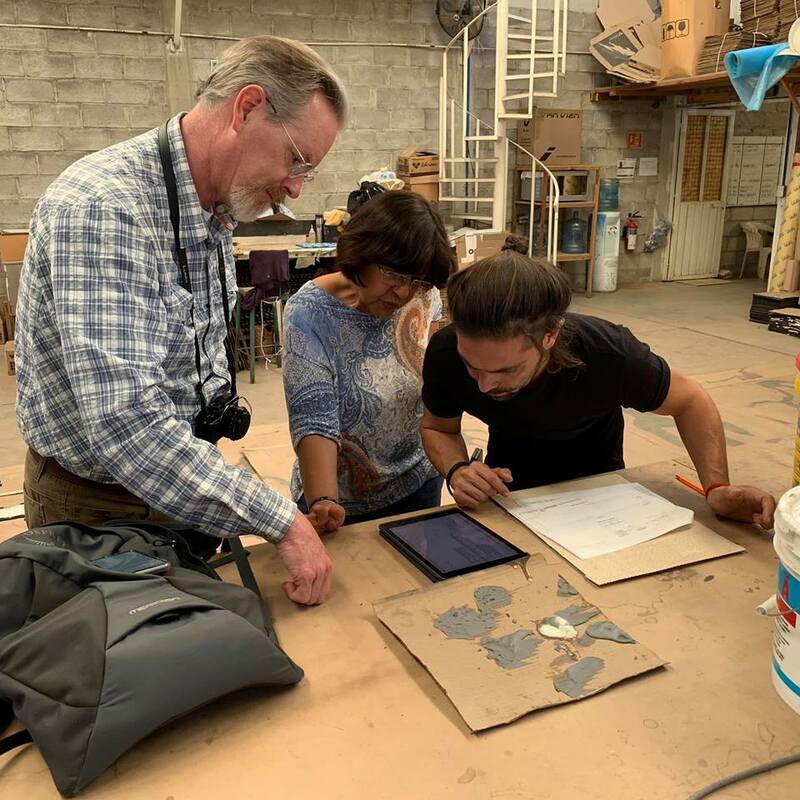 Creative Project Manager, John Grant traveled to Mexico City as part of an upcoming installation with Denver based artist William Matthews and installation wrapped for a new work by Denver based artist David Zimmer which will be unveiled in downtown Denver soon. Thank you to all of our amazing partners who helped to complete these incredible projects in 2018. We look forward to another amazing year ahead full of new and exciting creative challenges.